okay so i have the ILT range in two different patterns the earlier and the latter which was just the ILT logo in letters. the older patterned set has the following numbers. 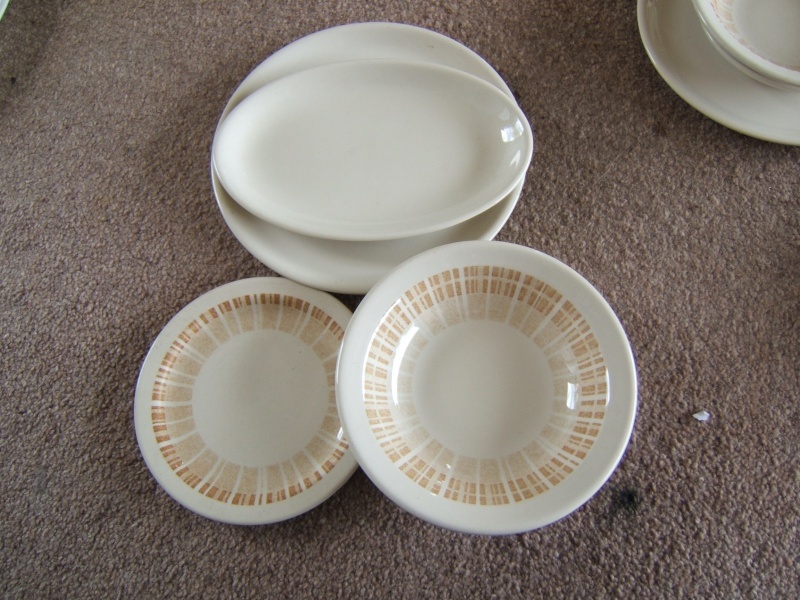 71, except for the "vitrified" items which are 7,saucer 8, bowl. the later items have 79 , 81 and are all sup/vit. 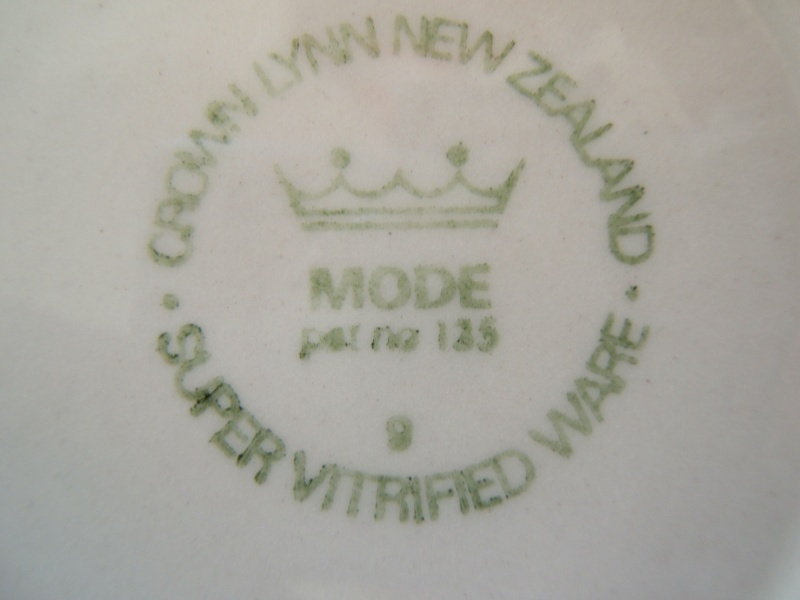 My Invercargill city council dinner plates and saucers are numbered 71 for dinners plates and 83 for saucers thats a 12 number gap and if we are looking at year of manufacture a huge gap between runs. more to follow as it is unearth for packing for the big shift. The lower numbers bother me ..... What do they stand for? Why are there low numbers? Perhaps you haven't found all of the pieces that are out there narna to fill in those gaps? Still pondering.... wondering ... and I have looked up Alan Tophams ph number ..... too busy to call atm. re What do the numbers on vitrified and super vitrified stand for? And so the puzzle continues, but first I can confirm that the RNZN Plate is 1950's, spoke to an old matelot I know today and for those who are puzzled about the Insignia, an entwined WR, it stands for Ward Room where the Officers dine, curiously the same comment about the RNZAF plate which was also for Officers. The History Curator at Te Papa has confirmed that their sample YMCA plate which is similar to the RNZAF sample would have been made in the 1950-70 era and have changed their data. The back stamp is CL Vitrified as in Monk Page 156 2nd to last in row two (1960's Estimate) Not 100% conclusive but some help.The back stamp shows the number 8 in this instance. More confusion though when I look through my Pioneer collection. 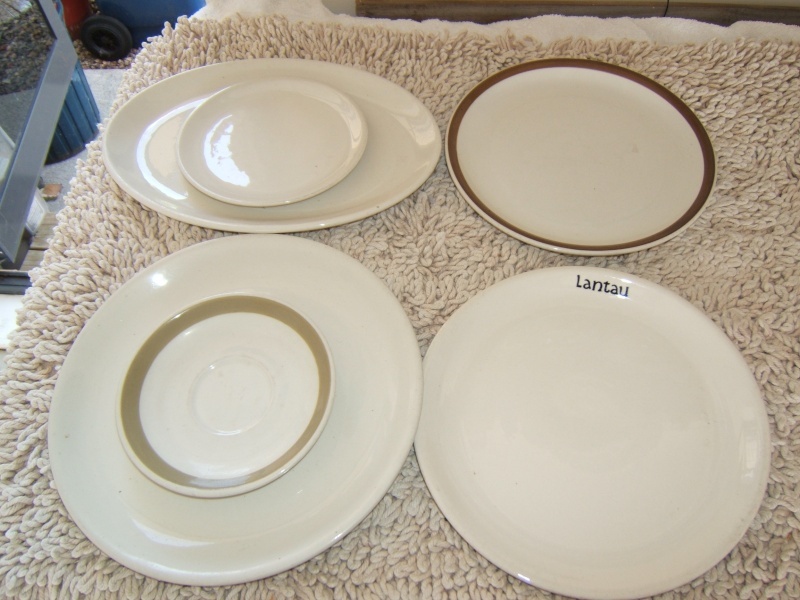 Oval Entree Plates 85,86,87 and Pioneer D877 for example. All are Super Vitrified but all have slightly different measurements except 87 & the Pioneer example which are exactly the same in all respects. All above in Pioneer Honey Brown glaze and at a casual glance they are all the same except that they don't stack nicely. My sample of the Hospital design is a Dinner Plate 225mm and is stamped 85 SVW the same number as the Oval Entree above. Hope this is helpful, will keep searching and thinking and wondering . as well as the coffee set I have uploaded, yesterday I grabbed (purely for this research) two SV side plates both identical in every-way except for the visible scuff marks and wear and tear they are 74 for the scruffier one and 84 for the more pristine one. the backstamps are quite different as well. So is it safe to say we are close to calling this and stating the numbers refer to year of manufacture. mrnarna wrote: So is it safe to say we are close to calling this and stating the numbers refer to year of manufacture. No sorry I can't go with the year of manufacture am more convinced that it relates to the mold shape used to make the piece of flatware. Remember that wee are only looking at VW & SVW flatware which whilst an important part of CL's production and was mainly sold through the Govt Stores Board it is only a fraction of their total output which was domestic ware which had a Pat.No.or D No. but could have used the same mold shape as the numbered piece. 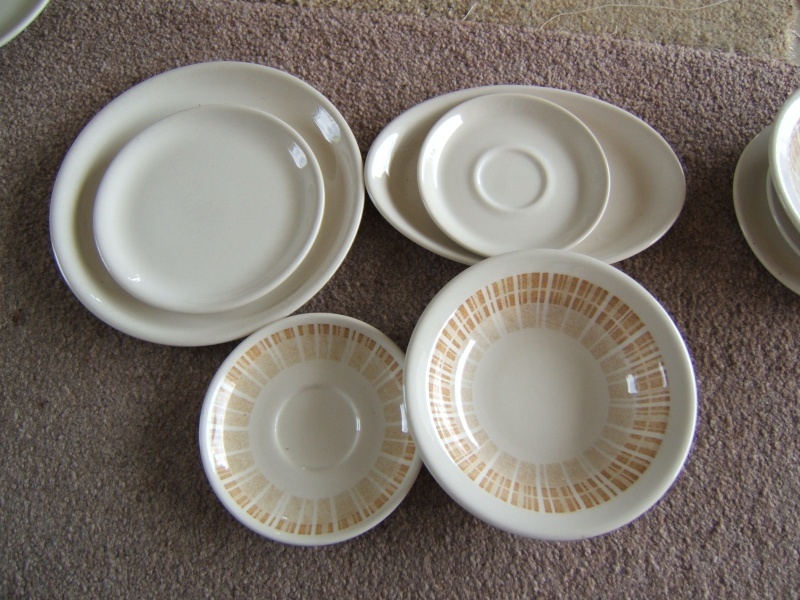 There are exceptions such as the Hospital Ware design but much of the this ware was not decorated and so the actual shape design would have been hard to determine on a casual glance hence the number system. I am sorry as well, I am with mrnarna on year of manufacture. Attached are some pics of multiple different shapes all with the same number. Cheers, marl rl g][/url] the 2nd pic is of number84s. something went wrong with my upload. Marl's photos prove to me that the number doesn't represent the pattern number or the shape number. It has a low Super Vitrified number - 9 .... please check your Reflections pieces for numbers everyone! If the number stood for the year, you would think that there would be some variation in the number ... huh? Mine also has RAC impressed on the base ....? 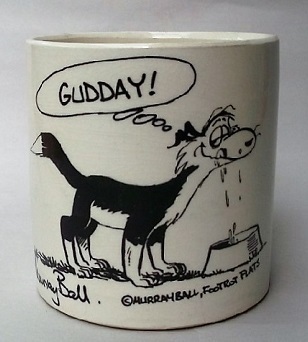 Ev phone Alan Topham or Chris Whatsit at Studio Ceramics and end the mystey in a few minutes. I don't have any Reflections samples but I do have a Cereal Bowl , Plain White 9.
bottom half of circle. A Crown with a line under in circle and the number 9. The diameter is 185mm and the details of the under side is different to the sample shown on Trade Me. Still unable to post photos. My one Supervit Reflections has 9 and the pattern name and number. I have also got Mode, Mayfair and Trentham, see pics.cheers, marl I do so love a puzzl e!! I think the lower numbers may mean something completely different from the 70-89. TonyK wrote: Ev phone Alan Topham or Chris Whatsit at Studio Ceramics and end the mystey in a few minutes. Yes I will when I get a chance Tony ..just overloaded atm ... can log in on the pc in the lunchroom at work BOOM BOOM!!!... in the meantime we keep on truckin. His recollection is that the numbers stood for the YEAR !! The single numbers he thinks represented the years of the 1960's ....? He is going to contact Colin Leitch to confirm this though and let me know. So congratulations to all of you who worked out all by yourselves that the numbers represented the YEAR! I had a great talk with Alan Topham at the opening of the show at the Gus Fisher Gallery - he had entertaining stories from his time at Crown Lynn - he'd gone with Tom Clark to the US to headhunt Dorothy Thorpe and had also worked for Roy and Don McKenzie as a buyer before he joined CL - as we stood next to the display of Billy Apple's Dorothy Thorpe pieces he said that like the Smisek, the Carpay and the Shufflebottyhotham works they didn't really represent Crown Lynn's output which was almost entirely dinnerware. That would be why the Carpay/Smisek/Thorpe etc are so collectable though wouldn't it? As the 'runs' would be short compared to the tableware .... ? Was 1965 the first year of dating, other than on wares for Gibsons & Paterson? At the point in the topic I have linked below Ev gives examples of vitrified year numbers, commencing with 2 and 3 (supervitrified) then jumping to 6 (vit and supervit) and on into the 1980s. 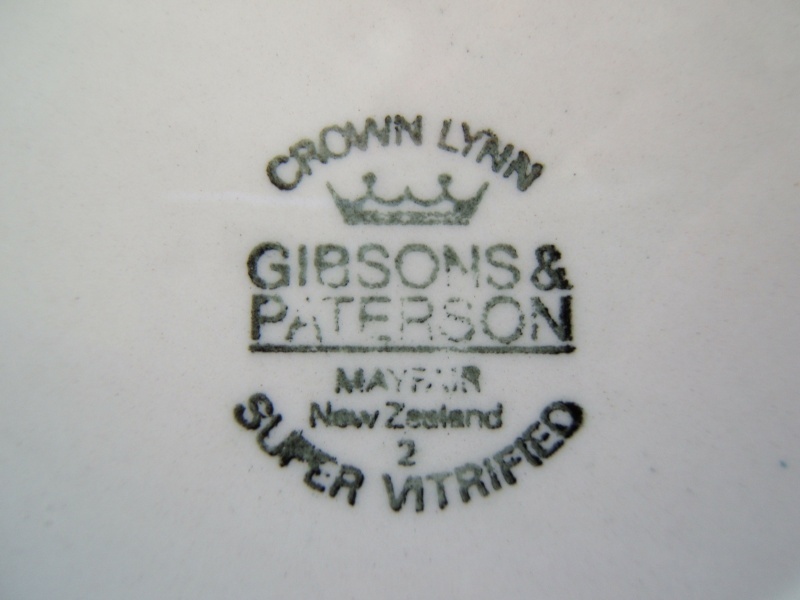 Further on photographs are added showing that the 2 and 3 are supervitrified made for Gibsons and Paterson. The first non-Gs&P number stamp is 6 for 1966. I have come to the conclusion that while there was talk of year numbering before 1962 and various attempts at adding numbers the backstamps for Gibsons and Paterson were the first recognisable pattern of year numbering. As 6 is the earliest non-Gs&P so far (and I have seen some sixes, more 7s and many 9s) I had assumed that 1966 was the commencement of universal year numbering for vitrified wares. 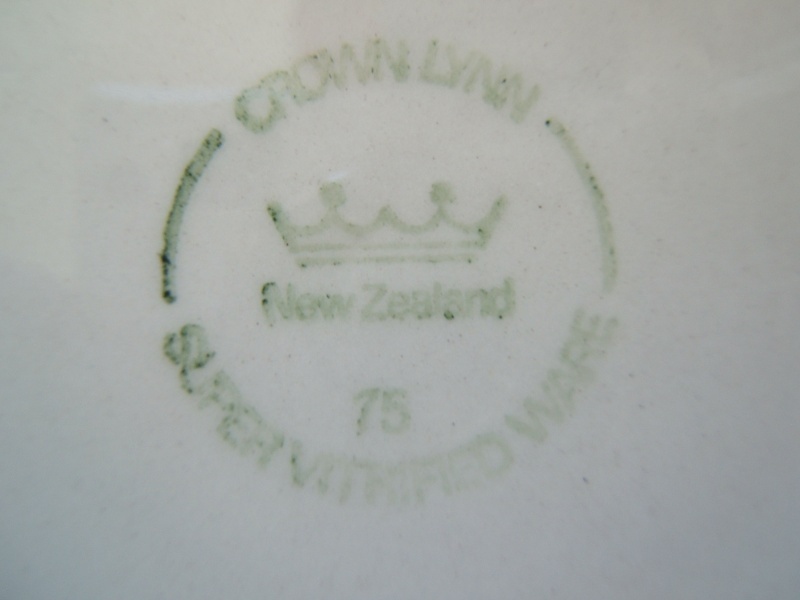 I was delighted today to find a 700 cup with a 1965 vitrified mark (crown and number replacing crown and star). Photo added. These numbers are useful for dating vitrified wares where no documentation is available. 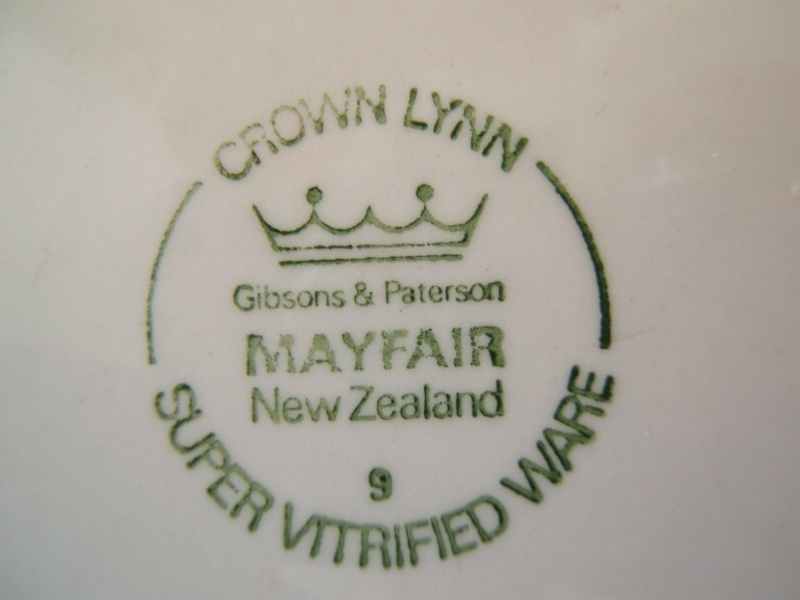 What this latest find tells me is that crown and star stamps on vitrified wares ended by 1964 or 1965. 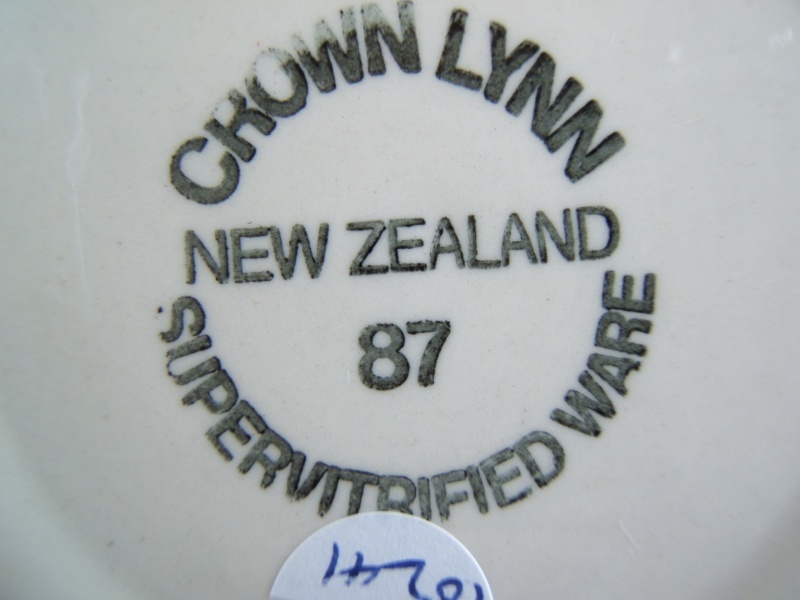 This is consistent with previous writers (Gail, Val) observations on the general use of the crown and star backstamp (earthenware) as 1955 to 1965. 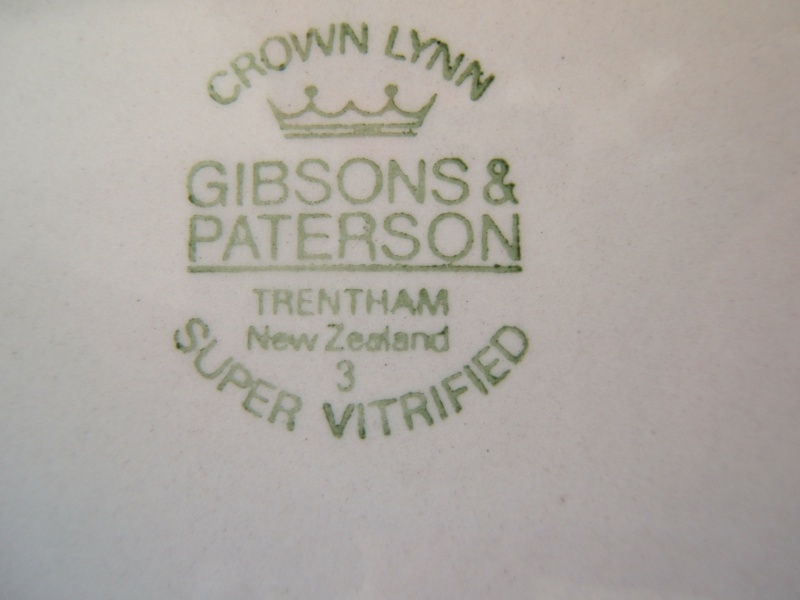 Does anyone have a CL vitrified mark (non-Gibsons & Paterson) earlier than 1965 or is this it? 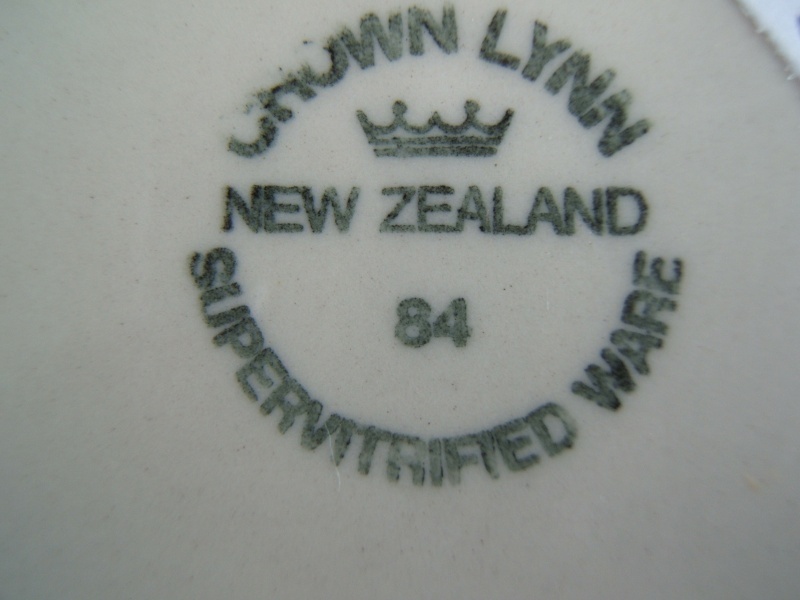 Since writing I have seen an NZR cup with same numer on tm, essentially the same but for the monogram.